Searching popup messaging application for Linux is not hard. Kopete has the feature but the default installation fails in receiving message. Sending message works though. 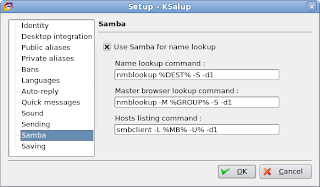 Due to this problem, I try to find another application that can send and receive winpopup message via SAMBA. Enter KSalup. I couldn't find this package in major Fedora repositories. However, it can be downloaded from the project's download page. After installation, entering basic settings like WORKGROUP, HOSTNAME, ways to find other hosts in LAN, one can use it straight away. Sending and most importantly receiving are OK. 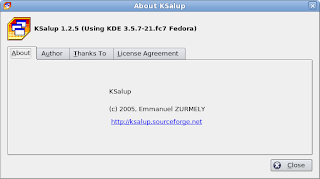 However KSalup lacks of add-on feature like some of other winpopup-like applications have, that is sending files. 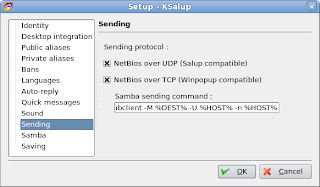 Put that feature aside, KSalup is a nice winpopup application for Linux. At least you can send and receive messages with your friends who using Windows in your LAN. By not connecting to IM servers outside like Yahoo!, Google Talk, IRC or MSN, one can save a little bit of bandwidth :P.